I remember moving from Smithers to Merritt, packing up all my belongings and hitting the Highway 16, turning right down Highway 97 until I drove into the Thompson-Nicola area. The scenery was absolutely gorgeous in mid-August, with some great stops along the way, but the breaks that really made the trip worthwhile were the rest areas. Whether you’re travelling for work or for a bit of sight-seeing, it’s really important to stop now and then for a little refresh – to eat, to take a bathroom break, to empty your garbage, to stretch those legs, etc. BC has about 170 rest areas for you to check out and we’ve put together a handy BC Provincial Rest Area map for you to see where they all are. You will also see them on the DriveBC map, if you activate the Rest Area icon on the legend. Are these all the rest areas in our province? No. We hope to get there, but these are the ones maintained by us and the highway maintenance contractors. There are some provided by communities or in national parks (federal) or run by private businesses that we have not included but we hope to eventually make this more comprehensive. Check out our Using Provincial Rest Areas Map page for more information. So whether you’re a professional driver, weekend warrior, commuter, sight see-er, or for any other reason you’re taking advantage of those provincial rest areas, you have your own unique perspective and we’d like to hear what you have to say. Drive safely. The Hope Slide Rest Area has electric car chargers but the gate is locked. My cord is NOT THAT LONG! Hi Dave – we are looking into this for you. Stay tuned. Please contact the Maintenance Contractor for the Coquihalla Highway, to see if they may have found your bag. VSA Highway Maintenance Ltd — 1-888-315-0025. Please contact VSA Highway Maintenance Ltd at 1-888-315-0025, to see they may have the bag you left behind at the Coquihalla summit restroom. 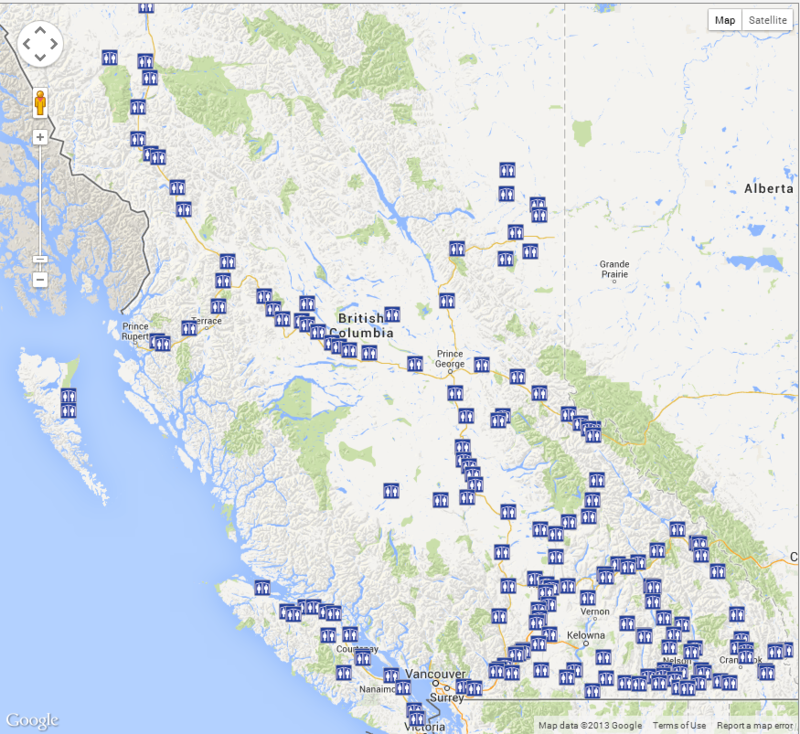 Please make your “Cheat Sheet for BC Provincial Rest Areas” map a downloadable *PDF file. Thanks for the feedback Larry – we have shared it forward. We stopped there for a much needed bathroom break, I opened the door to the washroom and slammed it shut. The filth was unbelievable, feces all over the toilet everywhere, not fresh it was old and the washroom was in a terrible state. This is not the first time it has been like this. The one on highway 5 A is bad also. Highway trucks go up and down all the roads many times a day, why can’t they stop use a power washer and clean these public washrooms. No one should have to clean this kind of mess by hand but if they were cleaned properly and often then the public could at least us them. I feel sorry for the truckers having to pull in there and try to use this washroom, after all these people live on our roads and deserve better. These rest area washrooms are worse in the Winter, Spring and Fall. I hope something is done about this issue and soon. Thank you. We are sorry to hear about your experience, and have reported it to VSA Maintenance (1-888-315-0025), the contractor responsible for cleaning the Hamilton Hill rest area and those on Highway 5A. We live in California and have traveled through BC several times. We love your country and tour BC highway rest area system. We will be traveling through BC enroute to Alaska in the spring of 2017. We will be utilizing rest areas, as well as RV parks for nightly stays. We have a large RV trailer that doesn’t fit well into smaller Provincial Parks, so we have to use rest areas to ‘rest’ some nights. California rest area rules are a ‘8 hours max’ stay. Are BC rest areas still only 4 hours, and is that 4 hours enforced away from major city areas? Thanks for connecting with us here. You are free to use any BC Rest Area to catch zzzz’s while you are travelling, but we try to discourage motorists from using rest areas for more than four hours at a time. Rest areas can be dark, secluded and remote which lead to safety concerns regarding those camping overnight. BC Parks have many campsites available to travellers day or night and we encourage you to camp overnight there. We have done some digging and have found that not all rest areas have “no camping” signs posted. Often they are posted when it’s found that longer-term camping is becoming a problem at a particular rest area. Overall, in terms of overnight stays, rest areas were originally envisioned for motorists who are too tired to continue driving and need to pull over and rest for a few hours, but we don’t believe that those who are homeless are turned away. Hope this helps. Happy travels! We have shared it forward on your behalf. Our pit toilets are generally provided by a company called Leko Precast Hope that this! the rest areas in canada and the governments policy are an absolute disgrace which they should be thoroughly ashamed of! permitting only 4 hours of sleep endangers the life of drivers, and passengers including children as well as other drivers and passengers on the road. i just drove from florida to bc. and the difference between usa rest stops and government policy with canadian is unbelievable. the americans provide a rest stop approx every 100 kilomentres on all the interstates i travelled. the rest stops had large buildings with exceptionally clean washroom facilities and food and drinks available in the many vending machines. there were absolutely no hassles from anyone for sleeping overnight in more than 6 months travelling. apparently the us authorities don’t want their sleepy travellers found dead on the road. canadian rest stops – canada’s shame! Thanks for connecting with us and sharing your concern. We are in the process of revisiting our rest area program and have solicited feedback from frequent users and are considering options for addressing the feedback we have received. We hope that this helps. The table below summarizes the rest area work that was carried out last fiscal (2015/16), this fiscal, plus planned work for next fiscal (2017/18). While we are aware of the work to be done at the rest areas mentioned above there are approximately 180 rest areas across the province needing a variety of repairs and it is going to take time for us to address all of the outstanding issues and short comings; but we’re working hard to get there. Oyster Bay	This site saw minor site improvements in 2015/16. Work including the re-gravelling of pathways, the relocation of picnic tables, and the limbing of trees. Roberts Lake	This site saw minor site improvements in 2015/16. Improvements included the relocation of the handicap bathrooms, repairs to bathroom roofs, and repairs to the site’s fence. Nanoose	This site received improvements in 2015/16. This work included the removal of 3 porta potties and the construction of 3 permanent concrete outhouse buildings. Furthermore the tourist information board was replaced, plus other small site aesthetic improvements. Big Tree	This summer the rest area was closed. This action was chosen because the site had limited potential to expand, plus safety concerns with vehicle egress/ingress. One of the more pressing safety issues relates to the poor visibility that drivers have when they are attempting to re-enter the highway. Excellent new H’Cap accessible toilets at Oyster Bay installed this summer. I went past one day & it was still the old port-a-potties; then just a couple of days later the new toilets were in place & the old ones gone! It would be useful if the info for each rest stop included whether a dump station was available. Thanks for your feedback. We have shared it forward for review. Grey water dumping stations are not standard for any provincial rest area. They may exist for other non-provincial (private) rest areas, but those are not included in our list. Hope that this helps. What is the time limit for rest stop use in B.C.? For example, am I allowed to park my self contained van and sleep for 8 hrs? 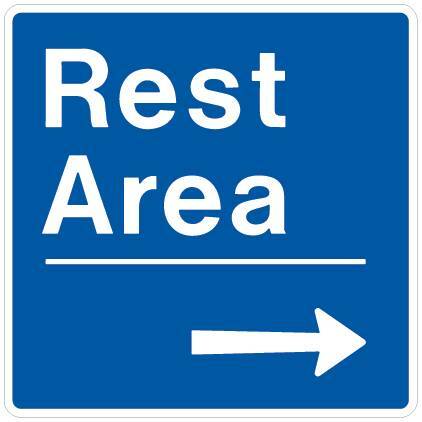 You are free to use any BC Rest Area to catch zzzz’s while you are travelling, but we try to discourage motorists from using rest areas for more than four hours at a time. Rest areas can be dark, secluded and remote which lead to safety concerns regarding those camping overnight. BC Parks have many campsites available to travellers day or night and we encourage you to camp overnight there. Hope this helps. Thanks for connecting with us here. Which device do you use? Unfortunately, there is currently no easy way to transfer the data from our site to your GPS. GPS devices use a special data file – specially named and formatted. Each device has its own format and there in no real global standard as yet, (although some companies are trying to). I put together a GPS POI file of all of the rest stops in bc. It is garmin poi format (works in my Nissan Rogue’s GPS). pretty slimmed down version, just the location, rest stop name, south/northbound and type of toilet. Let me know if you want me to email you a copy. I would appreciate a copy (gpx format) if you have created one. Besides toilets and tables, are there any BC rest areas that include services like fuel, food, laundry, showers, shops, etc? Thanks for connecting with us and thanks for the great idea! While provincial rest areas do not have services such as shops and showers, there are many municipal and community driven rest areas across the province that do. Hope that this helps! Thanks very much. Good to know. I guess the emphasis is on “rest”. But as you say, the other amenities can indeed be found in most communities along the way and usually not to far from rest areas. Travelers would be well advised to exercise caution and common sense in the dark hours. These areas(the ones I’ve seen so far), though lit and open 24hrs, are unstaffed and it’s unpredictable as to how frequently they are patrolled by RCMP. Some nights it’s not exactly a “family friendly” atmosphere, and it’s not uncommon for shady characters and practices to occur. To my recollection I can’t remember if any of these areas have public telephones. If not, it might be a good idea in terms of safety and emergency to have them installed. We just returned from a trailer trip from Alberta. We came back Highway 16 to Prince George and then south on 97 and through the Fraser Canyon to Maple Ridge. Somehow there must be some signage to indicate if the rest areas will accommodate large RVs and semi trailer trucks (perhaps a sign that indicates no vehicles over 25 ft., as seen in some states). We had a near disaster at the Goat River rest area as I followed my travel companions in (also towing a 25 ft trailer) when we realized there was no room to turn around. This necessitated both of us backing out onto Highway 16 (rest area is located at the bottom of a hill (both ways) and a turn. This was extremely scary (and highly dangerous) for both of us. Only a few miles down the road west was another rest area with lots of rooms for trucks and trailers. Thanks for your feedback. We are currently looking at ways we can expand the information available online and on the road about what rest area facilities are available to travellers. Stay tuned. Do you know which rest stops are the busiest in the province and would you have any idea of how many travellers use them? Sorry, we don’t have that information. Are there any rest stops between Vancouver and Barriere that have playgrounds? Rest areas are located just off provincial highways and all offer toilets (and most have picnic tables). They do not have playgrounds. You might want to look up the BC Parks along your route, as some parks offer playgrounds, and/or walking or swimming opportunities, and most are not far from the highway. Click on the “tree” icon on the map for details. Playgrounds are indicated with a symbol of children on a teeter-totter (aka see-saw). I am a truck driver, and it would be very helpful to know well in advance of a rest area whether or not the rest area is accessible to trucks. I’ve noticed that some highways have an axle limit, and some specify no trucks, and this is helpful. Thanks Chris for the suggestion. I’ll definitely pass this along.